In one of the most innovative industries, the medical field is wielding out revolutionary machines and breakthrough discoveries at a dynamic pace. This has led to the intensified demand for professionals, especially diagnostic radiographers. As the first link in the medical chain, radiographers tap into their in-depth knowledge of body structures and employ effective communication to ensure accurate diagnosis and treatment for patients. 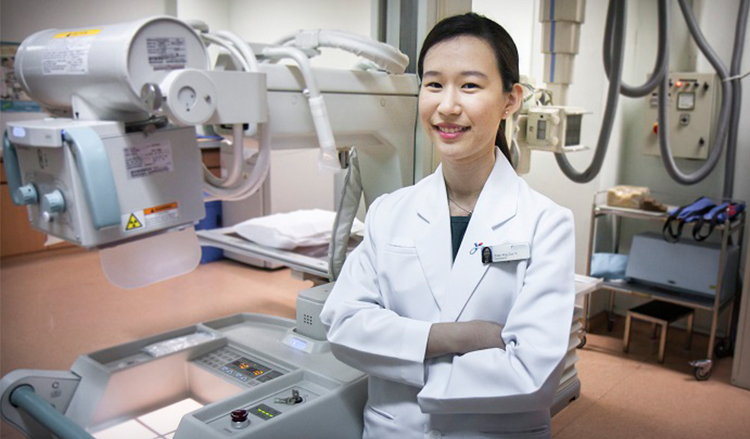 Healthcare Scholar with the National Healthcare Group (NHG), Zoey Ang Zuo Yi was one of those who answered the calling. She benefitted from the multitude of opportunities which ranged from before you start your degree, during your course of study, to after graduation. A leadership camp, healthcare induction course, and service learning programme will prepare you for your degree. Throughout the scholarship, students participate in community involvement projects, student exchange programmes, international seminars and conferences, and vacation attachments. After graduation, a re-entry programme, mentorships and healthcare leadership courses help scholars to facilitate into their role in the healthcare sector. Zoey elaborated on this experience in BrightSparks’ February 2017 issue. Share with us more on these opportunities you received under the Healthcare scholarship. Under the scholarship, I was given the opportunity to participate in an Overseas Community Involvement Programme to Indonesia. We learnt to install water filters for several rural schools, ensuring a supply of clean water for the young children in these communities. The trip not only helped to raise my global awareness and understanding of other cultures, but I also got to make friends with volunteers from other healthcare disciplines! This allowed me to better appreciate how different allied health professions can complement each other in the provision of quality healthcare. During one of my summer breaks, I also did a four-week attachment at Yishun Polyclinic’s Imaging Centre – one of the centres under the purview of National Healthcare Group Diagnostics (NHG Diagnostics). It was then that I had the chance to familiarise myself with Singapore’s primary healthcare functions. The experience has definitely prepared me well for my work today. What is the significance of your role? X-ray imaging is often useful in the diagnosis of diseases and injuries such as fractures. As diagnosis is the first step towards treatment and providing quality care, it is important for me to ‘capture’ high diagnostic quality X-ray images. This is to increase the accuracy of diagnosis and aid healthcare practitioners in timely management of their patients. What are some key qualities all radiographers should possess? Having an eye for detail is crucial. This will help us to identify any obvious abnormality in any X-ray image as early as possible. As healthcare professionals, we must also be prepared to face any unexpected challenges or medical emergencies. Most importantly, we must have a heart to care for, sympathise and empathise with our patients.